Here in Missouri its been really hot and dry which is unusual for June. I’m still swinging my coil, just not as long as I usually do. I’ll hunt until the heat of the day runs me off or my arm and shoulder makes me quit after swinging the coil through high grass for a long period. As I mentioned earlier in the year, I was going to see if running in manual was better than running in auto +3. After a period of frustration I finally reached a point of success. First and foremost, running the Etrac wide open in manual does not work in my area. What does work is letting the Etrac pick the best channel for the area your hunting. Use auto to find out what sensitivity number the Etrac thinks is best and use that number in manual. If the targets sound right, keep bumping the sensitivity higher until they don’t. I’ve even dropped the numbers to get a better sound and target ID. Here’s the key, getting the best sound and target ID will make you more successful than just trying to go deeper. If my machine is running too hot, the loud conductive shallow targets will hide almost all other targets under the coil at that time. Also, if your falsing on most targets (Meaning the sound and numbers are not matching the targets consistently at normal depths) your going to miss good targets. I’ve found that 22 sensitivity is about the best number in most places I hunt. But your going to miss deeper targets! 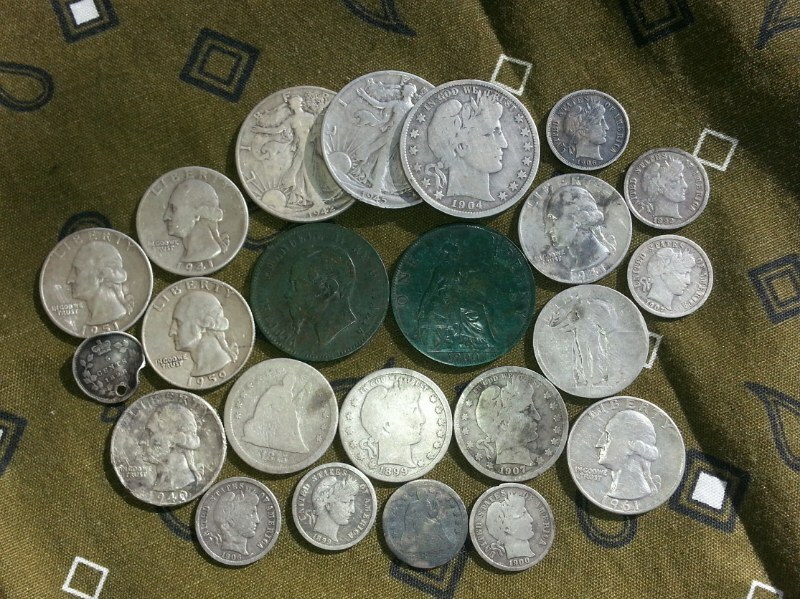 Not necessarily, I hunted a park this Spring in auto and found many silver coins. I went back and hunted in manual and found 4 silver dimes I missed. Two of them I could not see in auto +3! My Etrac in auto was running at 24 plus three which would be 27. I hit the Mercs in manual 22, but in auto 27 it couldn’t ID them. Both dimes were 6-8″. Why? Both Mercs had shallower high conductive targets inside the coil area with them and the Etrac could not adust quickly enough to properly ID the deeper targets. Obviously, it doesn’t happen all the time or the Etrac would be worthless, but it does happen. I managed to find two silver rings. One really large and another smaller than the diameter of a dime. A really small baby ring I suppose.